Is the world becoming more dangerous? The answer is ‘yes’—a qualified ‘yes’, according to research results of the Institute for Economics and Peace (IEP), a non-profit think tank based in Australia. 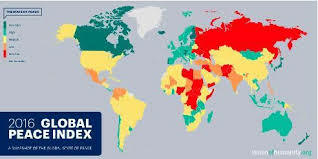 The Institute established an annual Global Peace Index (GPI) ten years ago, measuring negative peace in countries around the world using 23 indicators related to levels of militarization, societal safety and security and on-going conflicts. “Those 23 indicators are really looking at fear or direct violence,” Breslauer says. According to the 2016 report, Iceland is ranked as the most peaceful country among 163 independent states and territories and Syria, the least. Canada is in eighth place.